Pushing past the exome. Family exome sequencing has become a standard technology to identify de novo mutations in neurodevelopmental disorders including autism, schizophrenia, intellectual disability and epilepsy. Despite the many advances in the field, exome data is confusing and difficult to interpret. Accordingly, we were wondering what the increase from exome sequencing to genome sequencing might add other than more data and more questions. Now, a recent paper in Cell reports on family-based whole-genome sequencing in autism. And some of the results are quite surprising. Genome vs. exome. One of the difficulties in interpreting trio exome data for de novo mutations is the high mutation rate in the genome. Only a few years ago, we would have thought that a deleterious de novo mutation in any gene in the human genome is such a rare event that it is probably causal for the patient’s disease. Ever since the beginning of last year, we know that this is not true. Exonic mutations are frequent and – depending on the algorithms used – every individual carries 3-5 de novo mutations in his or her exome. But what about the entire genome? 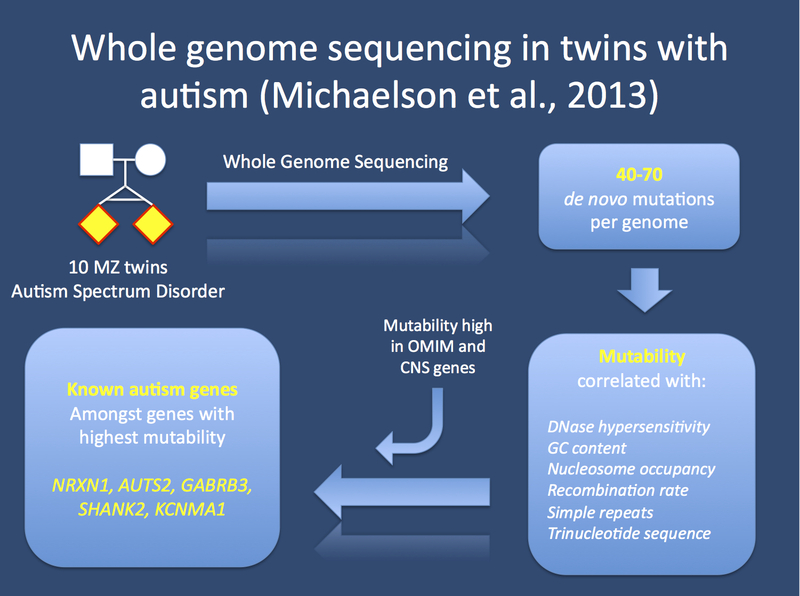 Michaelson and collaborators have performed sequencing in 10 monozygotic twin pairs with autism and their parents and looked at the genome-wide mutation rate. They identified 42-75 de novo mutations per individual in the entire genome. Much of the variation in the mutation load could be explained by paternal age as previously suggested. However, the most surprising finding of their paper is the fact that mutations are not randomly distributed throughout the genome. Mutation hotspots. We already know from copy number variation that there are specific genomic features that predispose to de novo structural genomic variation. These genomic hotspots give rise to many of the known microdeletions implicated in neurodevelopmental disorders. Apparently, a similar phenomenon occurs on the genomic level. Michaelson and collaborators found that the rate of de novo mutations varies widely within the human genome. And the rate of mutation is correlated with several genomic features including DNase hypersensitivity, GC content, nucleosome occupancy, recombination rate and repeats around the site. This creates a colorful map of hot spots and cold spots of mutability in the human genome. And interestingly, some autism genes are within these hotspots. Study design of the publication by Michaelson and collaborators. The authors sequenced 10 monozygotic twins with autism and their parents to identify de novo mutations. They found that de novo mutations are correlated with specific genomic features and that some of the known autism genes are hypermutable. The autism hotspot genes. The authors stumble across an interesting finding. The mutability has a strange correlation with evolutionary conservation. One would usually think that regions with higher evolutionary conservation would be spared from frequent mutations. However, this is not the case. Some of the most conserved regions are in fact regions with a high or very high mutation rate. Interestingly, disease genes as identified by OMIM tend to have a higher mutability. Also, brain genes appear to have a significantly higher mutability than genes not expressed in the brain. And, most surprisingly, some of the genes implicated in autism including NRXN1, AUTS2, GABRB3, SHANK2 and KCNMA1 had at least one exon in the top 20% of the mutability range. In parallel to the genomic hotspots observed with copy number variations, genes implicated in autism are located within mutation hotspots. And this has important consequences. Implications for EuroEPINOMICS. The high mutability of CNS genes and in particular autism genes speaks very clearly for a prominent role of de novo mutations in human neurodevelopmental disorders. This is something that I would not have expected, as I would have put a larger emphasis on recessive mutations or complex genetic architecture. However, publications like the paper by Michaelson and colleagues suggest that the role of de novo mutations might be much higher than anticipated. Also, the analysis for genome-wide de novo mutations might become a primary investigation to identify the genetic cause in a wide range of CNS diseases. This entry was posted in 2013, Brain malformations, EuroEPINOMICS, Papers and tagged autism, de novo mutations, GABRB3, hypermutability, mutation rate, NRXN1, SHANK2, SHANK3, twin pairs, whole genome sequencing. Bookmark the permalink.